Governor-elect Godwin Obaseki, in his acceptance speech, described his victory as the dawn of a new era. He saluted his fellow contenders, urging them to close ranks for the good of the state. “This is a responsibility Philip Shaibu, my running mate, and myself do not take lightly. Our promise to build a state anchored on a productive economy that will transform and empower our citizens is sincere. We promised jobs. We promised empowerment of our citizens. We promised improved social welfare services, and a more secured state. “We will strive to deliver on all of these promises. As we travelled all over our great state selling our programmes, we also took note of your concerns and problems, and I want to assure you that we will do everything in our power to address them. Let me, at this point, sincerely salute the courage of all those who came out to exercise their franchise in spite of the intimidating manoeuvres of merchants of violence to derail the conduct of a peaceful, free and fair election; you are the heroes of this election! “You saw through their propaganda and lies, and you made the right decision. I am happy that the elections were generally peaceful with no loss of lives; I salute the spirit of Edo people. I also want to commend the Independent National Electoral Commission (INEC), as well as the security agencies, for their role in maintaining peace and order during the elections. “I want to specially thank President Muhammadu Buhari for his profound commitment to a new order in Nigeria. Mr. President, we deeply appreciate your presence at the grand finale of our campaign at Samuel Ogbemudia Stadium on September 6. That singular honour served as a tonic to our campaign. “I wish to also acknowledge and appreciate the support received from all the APC Governors as well as the leadership of our great party. Your efforts collectively laid the foundation for this victory. “I reserve very special appreciation to our Comrade Governor, Adams Aliyu Oshiomhole, for his vision and single-minded focus on the progress and development of our state. 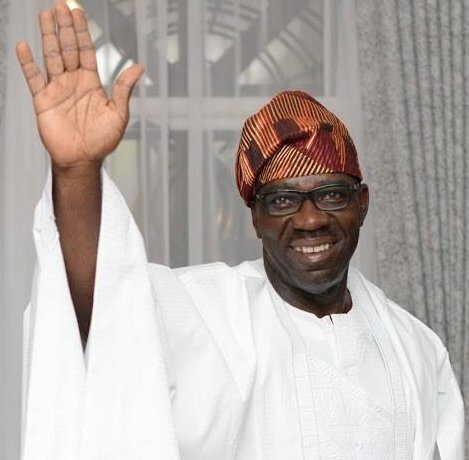 When everyone thought it was impossible, you proved to Edo people that government could, indeed, work for them. I want you to know that the legacy that you have built will live on forever! “I also wish to use this opportunity to salute my fellow contestants for putting up a gallant fight. This competitive campaign has helped us to sharpen our focus on some of the most important issues affecting our people. “The elections are over; it is time to bury the hatchet and close ranks for the good of our dear state. Our state is superior to all other interests and we must, as individuals, subordinate our personal ambitions to that of the collective. “As I end this address, let me say that a new future beckons. I pledge to work tirelessly for the good of all Edo people, irrespective of gender, social status, ethnicity, religion or political affiliation. “But the success of Edo State does not depend on government alone but on each and every one of us. I therefore ask for your support and prayers in the challenging task of leading our state and charting a refreshing future for our children.